Are you tired of loud, bulky water heaters? The problem isn't limited to traditional water tanks. Some tankless units are so noisy and cumbersome that it's hard to remember why you made the switch to a different system at all. The good news is that the Takagi T-KJr2-IN-LP isn't one of these units. Though it runs on propane, it's small, discreet and efficient, powering up to several showers at a time while working unobtrusively in the background. It's the kind of tankless water heater you buy if you don't want to expend a lot of effort maintaining it. You don't have to take my word for it, however. If you want to see the details of the T-KJr2-IN-LP for yourself, scroll on down. There are several numbers you should know when looking for a tankless water heater. Here's how the T-KJr2-IN-LP measures up. As you can see, it's a strong water heater that will get the job done. 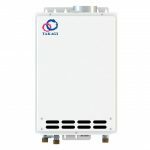 It's also a very lightweight unit; while some electric water heaters run smaller, the propane models tend to be much bigger because of everything they have going on inside the box. So the T-KJr2-IN-LP will give you propane power without the propane size. Speaking of propane, you should know in advance that propane tankless water heaters work pretty much the same way as natural gas units do. The only real difference is in the way the emissions come out. For the T-KJr2-IN-LP, you'll need stainless steel vents to handle the fumes. As for how well it works, I can personally offer the assessment that it handles like a dream, though you can also check out the glowing customer reviews on Amazon if you want a second opinion. The T-KJr2-IN-LP will deliver hot water wherever needed, and it can also handle simultaneous usage quite well for such a small model. Buyers should be informed, however, that the T-KJr2-IN-LP isn't really intended to be a "whole house" unit. It's a "point of use" unit, meaning that you may need to buy more than one if you have a larger home with multiple bathrooms. The T-KJr2-IN-LP offers temperatures of 150°F and above. This is right on par with other propane tankless water heaters, and it's more than enough to heat your showers and dishwashers to an adequate degree. As for flow, those who live in moderate climates can expect up to 6.6 gpm. If you live somewhere colder or more remote, your gpm may dip to 3-6 gpm because the unit has to work extra hard to combat the more extreme weather conditions. The temperature can be adjusted through switches on the unit, though you can also use a Takagi remote controller for added convenience. It's included with your order, so you'll have choices as soon as you open the box. 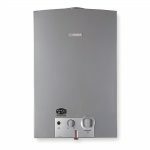 The T-KJr2-IN-LP is relatively easy to install, though you do need to pay attention to those vents; since the unit uses liquid propane to fire up the internal burners, fumes are unavoidable. I always tell my customers that a trained technician should handle the installation of tankless water heaters, but if you're determined to do it yourself, you shouldn't face much difficulty. 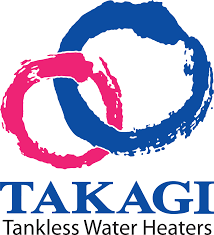 All Takagi units come with detailed instruction manuals, and they also have a highly-regarded customer service hotline for any questions or problems you may encounter during installation. As with any product, there are both pros and cons to purchasing the T-KJr2-IN-LP. Let's take a look at them more specifically. 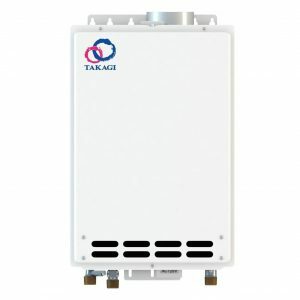 Though it has a bulky name, the Takagi T-KJr2-IN-LP Indoor Tankless Water Heater is anything but. In addition to being the smallest and quietest water heater from the Takagi line, it's also one of the most efficient. I'd give it a solid four and a half out of five stars, and I encourage everyone to check it out on Amazon for further details, specs and performance reviews. is this CSA certified for Canada?